fascinating shops and its beautiful squares. 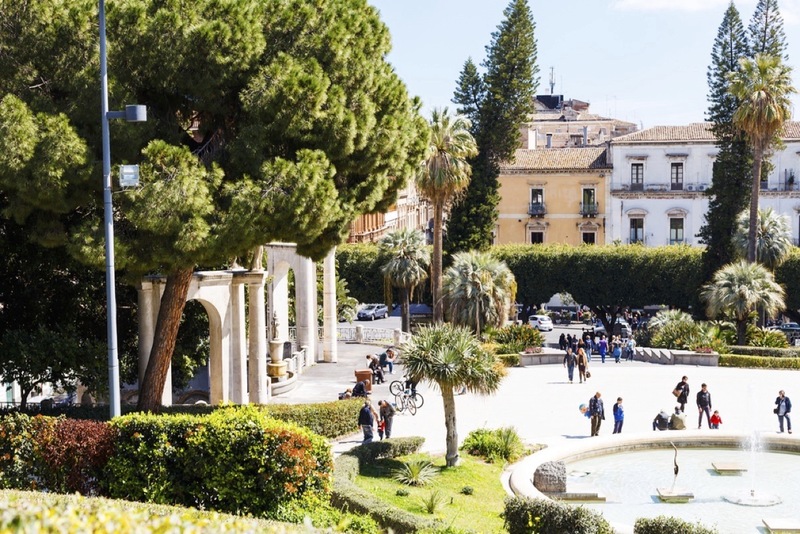 It’s here on Via Etnea that you will find the main entrance of Villa Bellini, one of Europe’s most beautiful public gardens, named after one of Catania’s most well-known musicians, Vincenzo Bellini. The street’s “sweet spot” is Savia, the patisserie that from 1867 has exemplified Catania’s baking traditions with its granite, arancini, cannoli with ricotta cheese and Sicilian cassata. The street was built in the late seventeenth century, after the 1693 earthquake. In accordance with the new urban road system, this road, first called Via Duca di Uzeda in honor of the Viceroy, was laid from the Duomo in the direction of Mount Etna. Along Via Etnea, many public buildings, palaces and seven churches were built, most of them designed by famous architects such as Giovan Battista Vaccarini and Francesco Battaglia in the Sicilian Baroque style. Not far from Etna 454, in Via A. Longo, you can find the beautiful Botanical Gardens which dates back to 1858 and hosts special collections, such as succulents, palms and wild plants from Sicily. Inaugurated in 1883, but in existence since the eighteenth century when it belonged to the Prince of Biscari, Villa Bellini has an entrance decorated with majestic ficus and its staircase is paved with white cobblestones and black mosaics, and ends up in a vestibule with a large fountain. From the vestibule, two paths cross each other going up one of the two hills on which the villa stands, separated by a square where horse carriages used to park until the early 1900s. Inside the villa you can see green lawns, gardens with many species of flowers, bridges, pools, fountains, statues and many shady avenues equipped with benches just right for relaxation. Facing the Ionian Sea, Catania lies under the shade of Mount Etna. It has been Greek, Roman, Byzantine, Arab, Norman, Swabian, Angevin, Aragonese, Spanish and, in its 2700 years of history, has experienced periods of splendor that are still visible in its nearby villages and this makes it unique. Today visitors can admire one of the most beautiful cities in Sicily, with a coastline that alternates between sandy beaches and lava rocks, and whose Baroque architecture is a UNESCO World Heritage. Via Etnea, Via Vittorio Emanuele and the adjacent streets are a succession of eighteenth century buildings, including Palazzo Biscari, the most important and imposing city mansion. In Piazza del Duomo stands the Cathedral. Going up Via Antonino di San Giuliano, after Palazzo Manganelli, you will reach Via Crociferi, an ancient sacred path of the Roman era with its extraordinary array of churches and monasteries in the Baroque style. Benedictines – a masterpiece of the late Sicilian baroque and a monastic complex which is among the largest in Europe, in which is housed a Domus Romana, the cloisters and a wonderful roof garden. The Roman era in Catania can be seen in numerous places such as the ancient Roman Theater, which has Greek origins and borders a smaller theater called Odeon. The Roman Amphitheatre is in Piazza Stesicoro which is also part of the Greek-Roman Archaeological Park of Catania. In the thirteenth century Frederick II of Swabia erected a symbol of his Imperial authority and power known as Castello Ursino, a huge manor which is now the Civic Museum of the city.